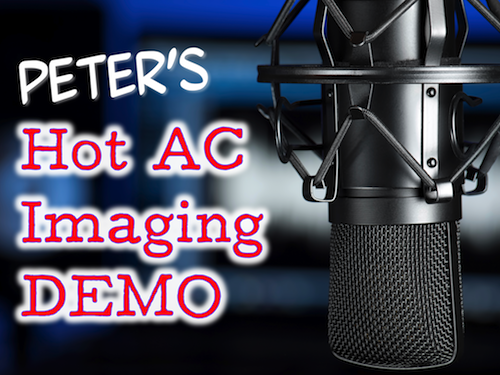 As a guy who started (and pretty much finished) my radio career working in a Hot AC format, it was probably about time that I fired up the microphone and recorded my new Hot AC radio imaging demo. People in radio are familiar with the term Hot AC (AC being Adult Contemporary). For those not so sure what the format includes, HOT AC plays most popular mix of music from the 90’s through today. The Hot AC format is most often music-intensive, Top 40 radio for adults, without so much rap or heavy metal/hard rock. And of course, it features a great station voice…ahem. There are a ton of popular musicians featured in this format which includes but not limited to Adele, Coldplay, Kelly Clarkson, Rihanna, Katy Perry, Pink and of course Taylor Swift. The big names in Hot AC when I worked in radio included Michael Jackson, Hall & Oates, Kenny Loggins and Sade. Man, have things changed since the 80’s. But that’s as it should be. Let me know if you’re a radio station General Manager, Program Director or Production Manager in need of a new station voice for a Hot AC station or any radio format. Cause I know a guy….